An unusual forage grass reported by a farmer 10 years ago led to its identification as meadow fescue (Schedonorus pratensis), a long-forgotten grass that seems just right for today’s intensive rotational grazing. Nontoxic fungi called “endophytes” live inside meadow fescue, helping it survive heat, drought, and pests. Unlike the toxic endophytes that inhabit many commercial varieties of tall fescue and ryegrass, meadow fescue’s endophytes do not poison. Meadow fescue is also highly adaptable, very winter hardy, and persistent, having survived decades of farming. It has gradually emerged from oak-savanna refuges to dominate many pastures in the Midwest’s Driftless Region, named for its lack of glacial drift, material left behind by retreating continental glaciers. Charles Opitz found the grass growing in the deep shade of a remnant oak savanna on his dairy farm near Mineral Point, Wisconsin. “The cows love it and produce more milk when they eat it,” Opitz says. 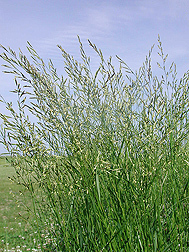 Michael Casler, an Agricultural Research Service geneticist, used DNA markers to identify Opitz’s find as meadow fescue—a once popular forage grass introduced to the United States about 50-60 years before tall fescue. Casler is at the U.S. Dairy Forage Research Center in Madison, Wisconsin. Brink and Casler have conducted a number of other studies on meadow fescue. In Brink’s test of three meadow fescue varieties against one orchardgrass and one tall fescue variety, meadow fescue had a nutritional forage quality advantage that may compensate for its slightly lower annual yield. Brink found that applying nitrogen fertilizer above 120 pounds an acre per year was economically counterproductive, because the efficiency of production, or the amount of yield produced per unit of nitrogen applied, begins to decline. The results of their studies would also apply to farmers who might want to raise sheep and beef cattle on pastures of meadow fescue. ARS has developed a new variety of meadow fescue, and its seed is being grown for future release.—By Don Comis, Agricultural Research Service Information Staff. This research is part of Pasture, Forage, and Range Land Systems (#215), an ARS national program described at www.nps.ars.usda.gov. Michael D. Casler and Geoffrey E. Brink are with the U.S. Dairy Forage Research Center, 1925 Linden Dr., West, Madison, WI 53706; (608) 890-0065 [Casler], (608) 890-0052 [Brink]. "Dairy Farmer Finds Unusual Forage Grass" was published in the March 2011 issue of Agricultural Research magazine.